What’s William Blue Open Day Like? William Blue is a university like no other. 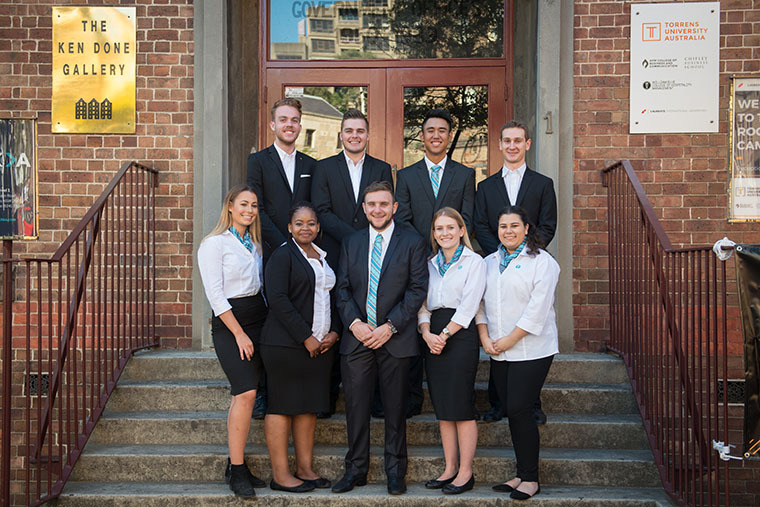 Nothing quite compares to its small intimate learning environments, in-house practical training, experienced lecturers and connections to some of the world’s leading hotels. We recently asked our students Lauren, Rosie and Tom to talk about their Open Day experiences and how it helped them choose to study at William Blue. Hi Lauren, what are you studying at William Blue? I started studying with William Blue in February 2016 and completed the Associate Degree in Culinary Management. Once I completed that, I decided to pathway into the Bachelor of Business (Hospitality Management) and I am due to finish at the end of this year. How did you find out about William Blue? I heard about the uni when I was researching online and then I ended up attending the August open day back in 2015. Can you us what Open Day is like? Honestly, it was the best open day I had been to by far. The highlight was simply that I was able to gain a real understanding of the campus, what life would be like as a student and the overall vibe. I felt such a warm welcome from everyone and a lot of excitement on campus. It was at that point I knew that William Blue was the place for me. Have you had much to do with open day while being a student? Yes, a lot! One of the perks of being on the SRC (Student Representative Council) is that I’ve been able to help out at almost every open day since I started at William Blue. It’s such a rewarding experience to be able to not only represent the university but also share my story with other students who were in the same position as me when I was in year 12. I actually met Rosie when she came to her open day, and since we are both culinary students, I was able to share my experience with her. Rosie, can you give tell us where you’re at with your studies? Sure thing! So I am studying the Associate Degree of Culinary Management. I started February of 2017 and will go on industry placement next trimester. Lauren mentioned that she met you at Open Day. Can you tell us more about your experience? I first came to open day in April of 2016 and was honestly blown away. Like many students wanting to study hospitality, I had been struggling to find a university that offered a hands-on approach to study, and the minute I saw William Blue Dining I knew I was in the right place. The students, like Lauren, also played a massive part for me as I was able to get a real insight into what study at William Blue would be like. Have you also been involved in Open Days? Yes, I have been! I’m really passionate about sharing my experiences with students like previous students did with me. I believe that having students providing a real perspective is a massive part of why William Blue’s open days are so successful! How about you Tom? As a new student to William Blue, have your expectations from open day been met? 100% they have! I am only into my sixth week of the Bachelor of Business (Hospitality Management), and I can honestly say that’s it’s been more amazing then I could have ever imagined. I came to a couple of the open days last year, and as time went on I was only more eager to start studying and become a part of the William Blue community! Great to hear Tom! Will you be involved in future Open Days? Definitely. I was able to play a small role in the Jan 2018 Open Day, and I’m excited to be able to be more involved this time around. I loved how welcoming and friendly all the students and staff were to me when I attended and I can’t wait to be able to be a part of that. Do you have any advice to students planning on attending Open Day? Lauren – my advice would be to ensure to give each and every activity that interests you a go! Walk around, listen to student stories and engage yourself in the surrounding environment. Also, don’t be afraid to ask questions! That’s what all the students and staff are there for so take advantage of it! Rosie – walk in with an open mind, and take everything around you in. Questions! Ask lots of questions, in this case, there are no wrong ones, so go crazy! I did, and I’m so glad because I was able to walk away and make an educated decision. Also, be sure to have a go and experience everything on offer! Really get a taste of what’s to come. Tom – my big tip would be to speak to the students. They are the ones who have gone through what you’re possibly going to do, so essentially, they are full of priceless knowledge! They’re always super welcoming and more than happy to have a chat.